Jessica McDonald scored in the 92nd minute. 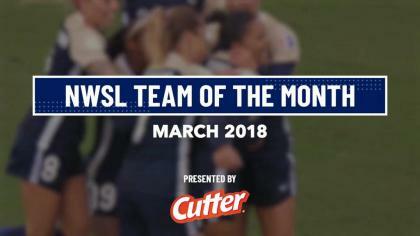 A late goal from Jessica McDonald served the North Carolina Courage their second straight win in the 2018 season. The Courage topped Sky Blue FC 1-0 on Saturday afternoon at Sahlen’s Stadium at WakeMed Soccer Park in front of a crowd of 4,078 fans. The Courage are now 2-0-0 to start the season, while Sky Blue FC suffers a loss in their first result for 2018. McDonald’s goal came in the 92nd minute mark off of a through ball from Jaelene Hinkle in behind. McDonald, who scored four goals last season for the Courage, made all the difference off the bench tonight. In 2017, McDonald became the first NWSL player to score 33 regular-season career goals, she now has 36 goals to date. The forward came on in the 55th minute for Kristen Hamilton, and wasted no time creating opportunities for the Courage, getting three shots off on goal in her 35 minutes of play. The Courage dominated the game in chances, with 23 shots to Sky Blue’s three. This is the exact same shooting ratio from the Courage’s game last weekend against Portland Thorns FC. The Courage defeated the Thorns 1-0 on opening NWSL weekend and outshot the reigning NWSL champs 20-3. The 1-0 scoreline is another familiar Courage performance, with 2017 seeing the Courage record eight wins with a 1-0 scoreline in regular season and the playoffs. Saturday’s first half could of suggested the game going either way; with both sides combining in the midfield and finding space out wide. Sky Blue FC were particularly impressive in Carli Lloyd’s presence in the middle. Lloyd, in her first game for Sky Blue, showed clear leadership in her combination play with rookie Savannah McCaskill and play with Shea Groom down the right flank. Equally impressive on the attack was the Courage’s Crystal Dunn who was going 1-v-1 against Sky Blue FC’s Mandy Freeman all game. Freeman held her own to Dunn’s pace, and limited Dunn to two shots on the day. In Denise Reddy’s first NWSL game, the new head coach for Sky Blue FC went with a one-two-touch passing game plan, that played in Sky Blue’s favor when executed. Between McCaskill, Lloyd, Janine Beckie and Groom there was no shortage of dynamic 1-2 passing to switch the attack and spread out the Courage. Sky Blue held a higher possession at 52.7% to the Courage holding a 47.3%. With the score 0-0 at halftime, the Courage came out of the first 45 ready to attack. Right off the bat, Hamilton was fed a perfectly paced left-footed through ball from Dunn. Hamilton looked for a far post finish, but her shot kissed the right post. McDonald came into the game after this, and both teams continued to push for the game-winner. Sky Blue FC saw two different free kick chances in the 81st minute and then the 87th minute, however Lloyd was unable to convert. Three minutes were added in extra time, and it took McDonald just two minutes to put her team on her back with a right-footed shot to the right post. Match ends, North Carolina Courage 1, Sky Blue 0. Second Half ends, North Carolina Courage 1, Sky Blue 0. Corner, North Carolina Courage. Conceded by Christina Gibbons. Goal! North Carolina Courage 1, Sky Blue 0. Jessica McDonald (North Carolina Courage) right footed shot from the right side of the six yard box to the centre of the goal. Assisted by Jaelene Hinkle with a through ball. Lynn Williams (North Carolina Courage). Rebekah Stott (Sky Blue) is shown the yellow card for a bad foul. Crystal Dunn (North Carolina Courage) wins a free kick in the attacking half. Substitution, North Carolina Courage. Darian Jenkins replaces Debinha. Savannah McCaskill (Sky Blue) wins a free kick in the defensive half. Foul by Jaelene Hinkle (North Carolina Courage). Attempt blocked. Jaelene Hinkle (North Carolina Courage) left footed shot from outside the box is blocked. Substitution, North Carolina Courage. Meredith Speck replaces Denise O'Sullivan. Substitution, Sky Blue. Michaela Abam replaces Shea Groom. Offside, Sky Blue. Sarah Killion tries a through ball, but Carli Lloyd is caught offside. Hand ball by Jaelene Hinkle (North Carolina Courage). Corner, Sky Blue. Conceded by Merritt Mathias. Offside, North Carolina Courage. Crystal Dunn tries a through ball, but Lynn Williams is caught offside. Substitution, Sky Blue. McKenzie Meehan replaces Janine Beckie. Attempt saved. Lynn Williams (North Carolina Courage) right footed shot from outside the box is saved in the top left corner. Attempt missed. Jessica McDonald (North Carolina Courage) header from the centre of the box misses to the left. Assisted by Merritt Mathias with a cross. Christina Gibbons (Sky Blue) is shown the yellow card for a bad foul. Denise O'Sullivan (North Carolina Courage) wins a free kick on the left wing. Attempt missed. McCall Zerboni (North Carolina Courage) header from very close range is close, but misses to the right. Assisted by Jessica McDonald following a corner. Corner, North Carolina Courage. Conceded by Janine Beckie. Hand ball by Carli Lloyd (Sky Blue). Substitution, Sky Blue. Adriana Leon replaces Katie Johnson. Attempt missed. Lynn Williams (North Carolina Courage) header from the centre of the box misses to the left. Assisted by Jessica McDonald with a cross. Substitution, North Carolina Courage. Jessica McDonald replaces Kristen Hamilton. Corner, North Carolina Courage. Conceded by Kailen Sheridan. Kristen Hamilton (North Carolina Courage) hits the right post with a left footed shot from the left side of the box. Assisted by Crystal Dunn with a through ball. Attempt missed. Denise O'Sullivan (North Carolina Courage) right footed shot from the right side of the box is close, but misses to the right. Assisted by Debinha. Attempt missed. Lynn Williams (North Carolina Courage) left footed shot from the centre of the box is too high. Assisted by Abby Dahlkemper following a set piece situation. Merritt Mathias (North Carolina Courage) wins a free kick in the attacking half. Attempt missed. Kristen Hamilton (North Carolina Courage) right footed shot from a difficult angle on the right is close, but misses to the right. Attempt blocked. Kristen Hamilton (North Carolina Courage) right footed shot from the centre of the box is blocked. Assisted by Crystal Dunn. Second Half begins North Carolina Courage 0, Sky Blue 0. First Half ends, North Carolina Courage 0, Sky Blue 0. Attempt saved. Debinha (North Carolina Courage) right footed shot from long range on the left is saved in the top centre of the goal. Attempt missed. Abby Erceg (North Carolina Courage) right footed shot from the centre of the box is high and wide to the right following a corner. Corner, North Carolina Courage. Conceded by Erica Skroski. Attempt missed. Lynn Williams (North Carolina Courage) right footed shot from the left side of the box misses to the right. Assisted by Jaelene Hinkle. Attempt missed. Janine Beckie (Sky Blue) right footed shot from outside the box is high and wide to the right. Assisted by Savannah McCaskill. Foul by Shea Groom (Sky Blue). Janine Beckie (Sky Blue) wins a free kick in the attacking half. Foul by Kristen Hamilton (North Carolina Courage). Attempt saved. Debinha (North Carolina Courage) left footed shot from outside the box is saved in the centre of the goal. Assisted by Lynn Williams. Attempt missed. Crystal Dunn (North Carolina Courage) left footed shot from the right side of the box is close, but misses to the right. Assisted by Jaelene Hinkle with a cross. Attempt blocked. Debinha (North Carolina Courage) right footed shot from outside the box is blocked. Hand ball by McCall Zerboni (North Carolina Courage). Hand ball by Katie Johnson (Sky Blue). Delay in match Sabrina D'Angelo (North Carolina Courage) because of an injury. Attempt blocked. Carli Lloyd (Sky Blue) left footed shot from outside the box is blocked. Assisted by Katie Johnson. Corner, Sky Blue. Conceded by Abby Dahlkemper. Attempt saved. 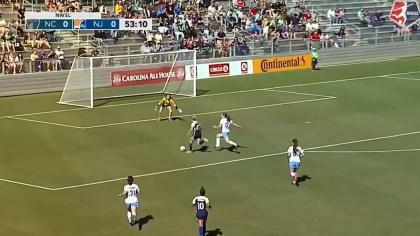 Denise O'Sullivan (North Carolina Courage) right footed shot from the centre of the box is saved in the bottom left corner. Assisted by Lynn Williams. Attempt missed. Lynn Williams (North Carolina Courage) right footed shot from the centre of the box misses to the right. Assisted by Denise O'Sullivan. Attempt blocked. Abby Erceg (North Carolina Courage) left footed shot from the centre of the box is blocked. Attempt blocked. Lynn Williams (North Carolina Courage) header from the centre of the box is blocked. Assisted by Abby Dahlkemper with a cross. Attempt blocked. Crystal Dunn (North Carolina Courage) right footed shot from outside the box is blocked. Assisted by McCall Zerboni. Savannah McCaskill (Sky Blue) wins a free kick on the left wing. Offside, Sky Blue. Janine Beckie tries a through ball, but Shea Groom is caught offside. Attempt blocked. Katie Johnson (Sky Blue) right footed shot from the right side of the box is blocked. Offside, North Carolina Courage. Denise O'Sullivan tries a through ball, but Lynn Williams is caught offside.